Gold metal coins are made from a solid brass alloy formulated to look like 18KT GOLD. 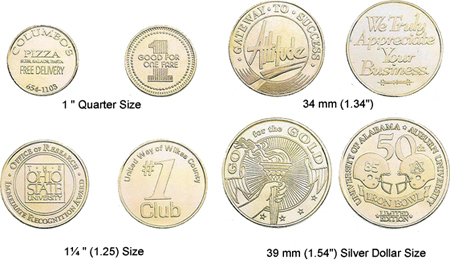 Besides having durability and weight, Gold coins and tokens capture the finest custom detail. These coins and tokens are die-struck on both sides and each coin is then individually coated with a fine jeweler's lacquer to retard tarnishing. Despite their beauty and appeal, Gold coins and tokens are economical enough to be used as traffic builders, for continuity programs, and much more. Any of our coins and tokens can be personalized with one of our 200 stock designs or with the image of your choice. Pricing includes lacquering to retard tarnishing,and bulk packing for 1", 1-1/8" and 1¼" coins; 34mm and 39mm coins are individually poly bagged.